Looking for Air Conditioning Robina Residents Have Been Raving About? At Think Cooling, we’re among the best air con providers the Gold Coast has to offer. We have premium quality products and services fit for all your Robina air conditioning needs. Different areas in the Gold Coast have experienced different rates of growth and development in the last decade. The area around Robina and Merrimac is a great success story, with many families now enjoying the facilities, location and properties. This ongoing growth means lots of homes and other developments in need of the best air conditioning Robina can get. Our local Think Cooling team has the right solutions for the right client. Why Choose Think Cooling for Robina Air Conditioning? There are homeowners across Robina, Merrimac and the wider Gold Coast region that will always turn to Think Cooling AC services. We are their first thought for new products, upgrades and basic maintenance. This is largely down to the friendly, personable nature of our team and the quality of our work. We are always keen to provide a good job and create a good relationship with our clients. Of course, these repeat customers also come back to us because of our knowledge, skills and general professionalism with every call-out. There are plenty of families that are turning to these areas to raise their families and get a little break from the city. There is the sense that while this has established a strong vibe and reputation, there is still room for further expansion. Clear Island Waters has only seen a marginal rise in population of 3.4% between 2011 and 2016. But, the areas of Merrimac and Robina have grown significantly more. Merrimac saw growth of 11.9% and Robina 12.6%. Residents in this area talk about the split in personalities between these two sites. People flock to Robina for shopping and head into Merrimac for the parks and chilled out atmosphere. There are also some great public transport links between the two and lots of homes and schools for families. The two have essentially merged to bring new families the best of both worlds. With so many families moving into Merrimac and the surrounding area, it makes sense to choose a reliable ducted system to keep everyone happy. These systems help to provide just the right amount of climate control across multiple rooms in one home. This means that long-term residents here could benefit by upgrading to a new, more cost-effective system. There are some great options available in this region and our Think Cooling specialists are ready to help you find the best one. The ongoing appeal of this region as a developing area for families means that there are also plenty of opportunities for retail and commercial developers. If Robina really is the place to go for some shopping in this Gold Coast area, residents need the best, most comfortable places to spend their money. A split system is a better option here because it offers economical cooling options for single rooms and smaller spaces. There are also some great new multi-split systems that are discrete enough for attractive new complexes. There are lots of large, family-friendly homes in Clear Island Waters and the surrounding area that could benefit from an upgraded AC system. A high-end, climate-ready MyAir system can handle the needs of individual family members. It does so with customisable room settings and a user-friendly home hub. This detachable hub acts like a tablet with a touchscreen and simple controls. This new approach is not common with Gold Coast air con specialists, but it is available from our Think Cooling technicians. Welcome to AC versatility like you’ve never experienced before! It is all about a family-friendly product and a family-friendly service when you choose Think Cooling. You need to be sure that you have the best system to keep everyone happy. At the same time, you need to be sure that you have a service you can trust. Call us today to learn more about how we can help you enjoy the perfect indoor environment all year round. 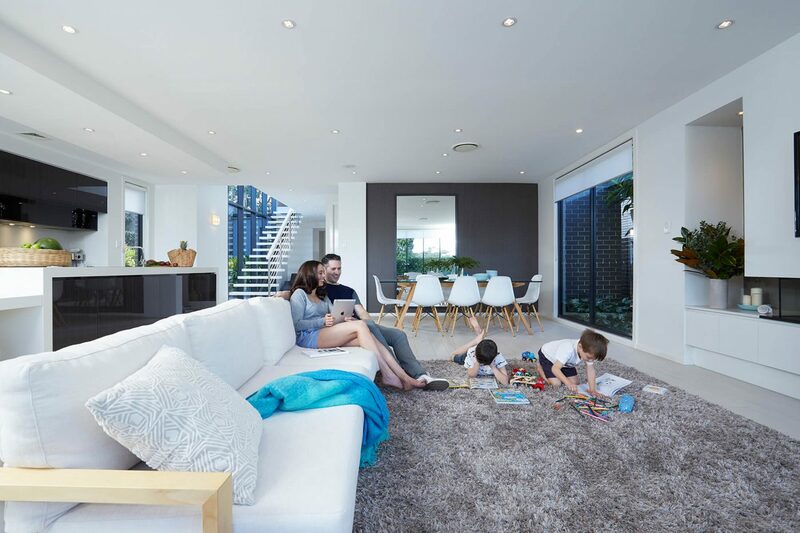 We can arrange an appointment that suits your family best and set up the best air conditioning Robina can offer.